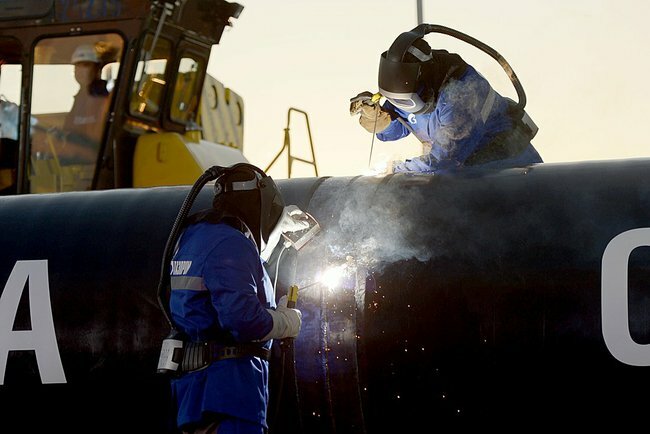 Russia’s plan to build a new $15 billion pipeline to Turkey has advanced with the draft inter-governmental agreement being sent by Moscow to the Turkish side on Tuesday, Russian media reported. Russian President Vladimir Putin proposed the project after the European Union blocked Russia’s planned $45-billion South Stream link. Russian energy giant Gazprom said it would build the new link to Turkey instead as it looks for routes to bypass Ukrainian pipelines from 2020. Russian agency Tass quoted unnamed officials as saying “”an intergovernmental agreement on the project’s first line with a capacity of 15.75 bln cubic meters” has been sent to Turkey on Tuesday. The “phased negotiations” shows Gazprom is near to starting an alternative project across the Black Sea, linking Russia with Turkey. Gazprom plans the new link to include four parallel lines with total capacity of as much as 63 billion cubic meters per year, one of which would supply Turkey. About 16 bln cubic meters will be given to Turkey. The rest would feed the EU through a network stretching into Greece and on into central Europe. Greek Prime Minister Alexis Tsipras has also given the go-ahead on joining the pipeline from Russia to Europe via Turkey and Greece. Russian and Greek Energy Ministers, Alexander Novak and Panagiotis Lafazanis signed a memorandum on construction of the extension of the Turkish Stream gas pipeline in Moscow last month. “The pipeline will connect not only Greece and Russia, but also the peoples of Europe. Our message that it is a message of stability and friendship… The pipeline we are beginning today is not against anyone in Europe or anyone else, it is a pipeline for peace, stability in the whole region,” Greek Minister Lafazanis was quoted by Russian state agency Sputnik.